The Rotten Tomatoes Tomatometer on this film is at 39%, which made me think that I was in store for a January movie. However, I like both Kevin Hart and Bryan Cranston, and honestly the trailers looked decent so I was ready to give this a chance. I really enjoyed this film. I wondered why so many other reviews had this as rotten. Listening to Jeremy Jahns on YouTube helped me to maybe find what the answer to that question was. 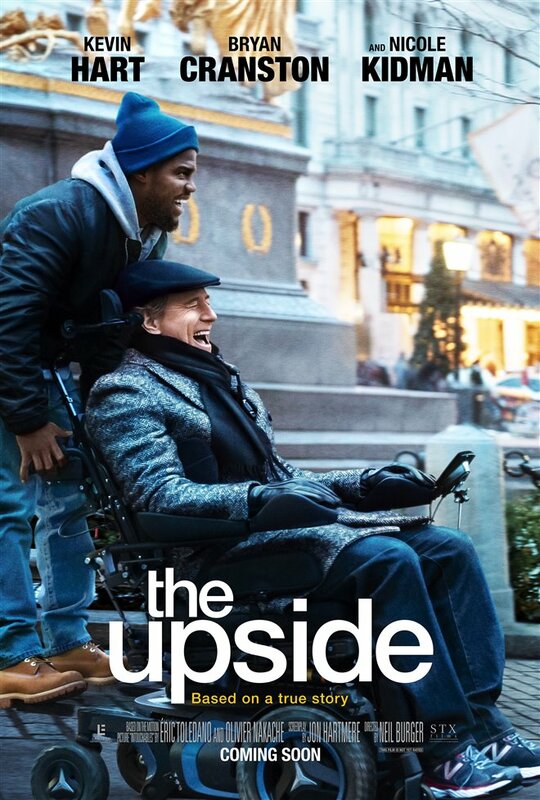 Apparently, The Upside is a remake of a beloved French movie called The Intouchables, which I have never seen. This fact makes me wonder if these critics are judging the movie versus this other movie instead of judging it as a film on its own. Dell (Kevin Hart) is an ex-con who is trying to get through life, struggle to repair a relationship with his son and get a job. Out of necessity, he replies to a job for a janitor, but winds up in the wrong place, interviewing with a wealthy quadriplegic Phillip Lacasse (Bryan Cranston) as a caregiver. Depressed and lacking care for himself, Phillip hired the clearly unqualified Dell instead of a crew of qualified candidates. Dell and Phillip have a genuine friendship and a connection develop during their working relationship that shows the strength of both actors. Honestly, this is the best performance I have seen from Kevin Hart in a long time. He was in control and contained instead of the “Kevin Hart”-type character that he always plays, loud, boisterous and chaotic. I found it to be a very welcomed change, proving to me that he was an actor. Understand, I have always liked Kevin Hart, but I think he is one of those comedic actors (Melissa McCarthy, Tiffany Haddish, Adam Sandler etc) who find themselves typecast and playing the same form of character in every film. This change is important for his career. Bryan Cranston is his typically fine self, always giving a professional and well thought out performance. His expressions were outstanding here, as he was unable to use his body in any other manner. The film was funny and warm and the relationship between Hart and Cranston was clearly at the center of everything the film did. Some of the scenes between them were outstanding and was the major reason to see the movie. Nicole Kidman played Phillip’s assistant Yvonne and she was great as she always is. I really enjoyed The Upside. I did not have a beloved favorite movie to compare it to so I did not have that blinding me to this movie’s charm as I fear many critics may have done.